A part of the brain, called the pituitary is affected. The pituitary gland is responsible for the production and regulation of many important hormones that influence the horse’s metabolism. 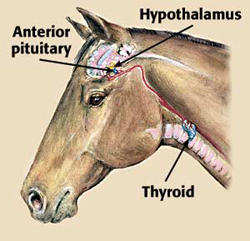 When a horse has PPID, one of the lobes of the pituitary gets enlarged and secretes an increased amount of hormones. Most horses that become affected with PPID are over 15 years of age. All breeds are at risk, but ponies and Morgans have a higher incidence. The most common sign of Cushing’s is a long, curly hair coat. The horse will often fail to shed a winter coat and then the hair will become long a thin. PPID can also cause horses to drink more and urinate more. Another very common and unfortunate clinical sign is laminitis. Other clinical signs of PPID are: muscle wasting/loss, increase of sweating, lethargy, increased appetite, and immunosuppression (increase of hoof abscesses, infections etc). 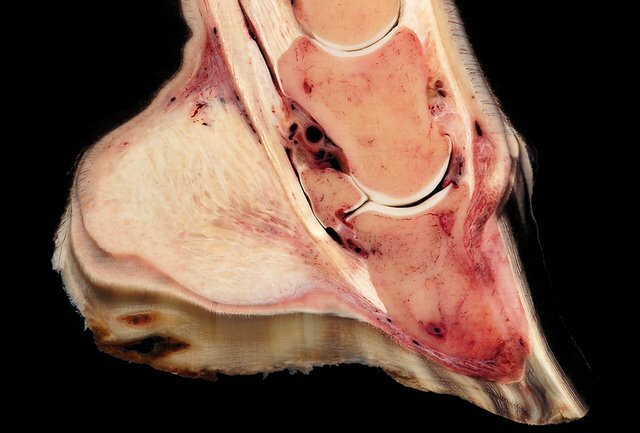 Diagnosing Equine Cushing’s syndrome can often be challenging. There are several methods for testing available. The most reliable test is called the “Dexamethasone Suppression Test”. For this test your veterinarian will pull blood to m measure plasma cortisol, then give your horse a shot of dexamethasone then return 18-24hrs later and pull more blood. In a normal horse, the dexamethasone would cause a decrease in cortisol. In a horse affected with PPID, the cortisol will remain the same. This test can be affected by the seasons, and it is best to avoid doing this test in the fall. Also, dexamethasone administration can be risky in horse that are prone to founder. Another hormone, ACTH, can also be used to screen for PPID. This is a simple test that only requires one blood draw. If ACTH is above the normal values, then it can be an indicator of Equine Cushing’s Syndrome. There are other diagnostic tests available that are less accurate. However, in a particular case they may be necessary to use. Your veterinarian will select the best test for your horse. The treatment for PPID is a drug called “Pergolide.” Pergolide is available from Boehringer Ingelheim as “Prascend”. This is the only FDA approved treatment for equine PPID. Prascend comes as tiny pills that you give to your horse once per day. Your veterinarian will tell you the proper dose to use. Often times, it is necessary to adjust the dose based on the horse’s clinical signs. It is important to make sure that horses with Cushing’s get regular deworming, dental care and high quality forage and grain. You may need to clip their long hair in the warmer months, and it can be difficult to maintain adequate body condition in these horses. Look for feeds that are low-starch and make sure to offer lots of good hay.